Tokens. A blog by Artist David Wills. : Good Art #34. The Scream. Good Art #34. The Scream. As the new year ticked in, time was called on copyright for Edvard Munch, Piet Mondrian and Wassily Kandinsky among others. With their work now in the public domain in many markets around the world — USA has to wait until 2019 — I guess we can expect to see all manner of renderings on all types of products in the future. 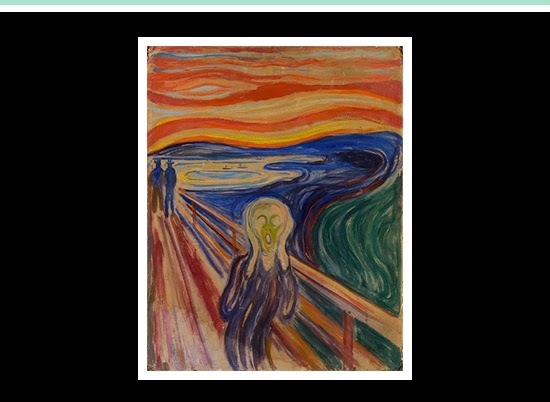 This week's Good Art is The Scream, a remarkable painting that has been referred to as a Mona Lisa of modern times and has the honour of being stolen at least twice, both times returned a couple of months or years later. There have also been a host of versions, but my favourite was one I photographed in Norway a couple of years ago. Drop by Hyperallergic for art news or The Public Domain Review.